Netizens took to social media and reacted on the recent pronouncement made by former Bayan Muna Rep. Satur Ocampo on his statement in an exclusive interview with ANC that his group is under attack of political harassment by the Duterte administration. According to Satur Ocampo what happened to him was politica harassment despite the fact that the ones who filed a case against them are all supported by the parents and leaders of the Lumad communities whom they claimed they were helping in Talaingod, Davao Del Norte. 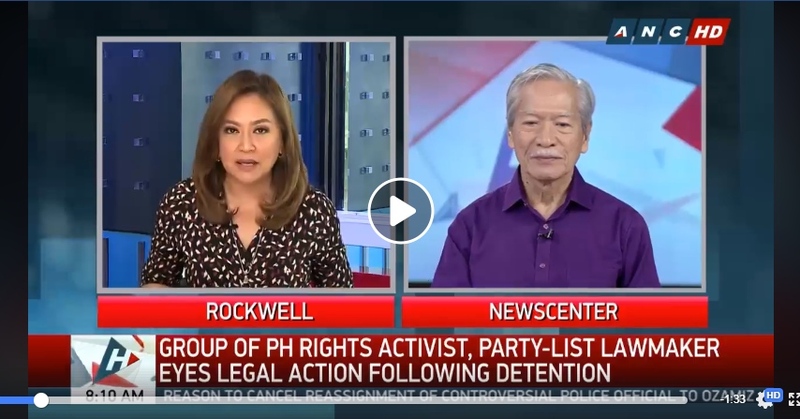 During the exclusive interview with ANC Host Karen Davila, Satur Ocampo was asked on how he describe the whole experience of being arrested and accused of multiple crimes during their so-called rescue and solidarity mission to help the Lumads in Talaingod. Satur Ocampo responded by saying that he has been a subject of this kind of political harassment since the Marcos regime, during the Arroyo administration, and this is the tenth time that he was accused of common crimes. The statement of Satur Ocampo caught the attentions of numerous netizens who bombarded the official Facebook Page of ANC News as they posted some harsh comments against Ocampo and the entire news outlet who reported Ocampo's statement. Kia Banto THANK YOU FACEBOOK! we can now hear, see and understand both sides of the story... sorry wala na naniniwala sa traditional media $$$. Mar Villalva Talaga naman wala na talaga pagasa bansang ito mga media kampi pa ..kita naman natin ang video ng mga lumad na di pinaalam ying mga batang kinuha nila..bandang huli PNP pa amg makulong kamukha ni Palparan. Ludwig Jacobson if you do not belong to the bias media you should also interview the actual victims, the lumads. remember there are 2 sides of the story. have you get their side yet ? Arv Travz Here goes the mainstream media again.... digging their own graves with their bias/slant/fake reporting. Trust rating six feet under the ground. Reg Rayvi ANC ..the people also want to hear what the LUMAD parents have to say about the alleged kidnapping issue the police filed against Satur...para malaman natin kung ano ba talaga nangyari...one side of the story lang ang ini air nyo eh. Emz Tampus Canete harassment tlga? wtf!!! how about the 14minors you brought in talaingod? can you please explain to us? for god sake!!! Rouel Anderson What do you call taking kids away from their parents and not informing them on where their going? That’s kidnapping Mrs. Davila.